The Lowland by Jhumpa Lahiri which is on the Booker Prize shortlist, Bleeding Edge, Thomas Pynchon’s new book which has garnered some ecstatic reviews and George Saunders piercing collection of short stories, Tenth of December, are among the ten books on the longlist for the National Book Awards Fiction Prize. 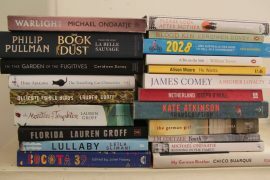 The announcement on Thursday means that the longlist in all four categories ( Fiction, Non-fiction, Poetry and Young People’s Literature) are now known. Five finalists in each category will be selected by mid-October with winners announced in New York on November 20. Pacific by Tom Drury; The End of the Point by Elizabeth Graver; The Flamethrowers by Rachel Cushner; The Lowland by Jhumpa Lahiri; A Constellation of Vital Phenomena by Anthony Marra; The Good Lord Bird by James McBride; Someone by Alice McDermott; Bleeding Edge by Thomas Pynchon; Tenth of December by George Saunders and Fools by Joan Silber.